On November 17, 2015, Wallkill East Rotary presented four new Paul Harris recognitions. Rotarian Sal Lucido, Anne Glenn-Fellenzer (Rotarian spouse), Chris Boyle (Rotarian daughter), and Maureen Plain (Rotarian spouse) are new Paul Harris Fellows in our Wallkill East family. 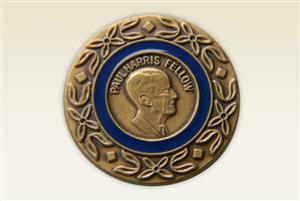 A person becomes a Paul Harris Fellow (PHF) when they donate $1,000 to the Rotary Foundation. Rotarians can become PHF themselves and they can also donate in someone else's name. When you give to the Rotary Foundation, you support Rotary's work around the world through projects that change lives around the world.